As the long weekend gets rolling, it's time to start thinking about which live music options to check out over the course of the next four nights. There's no shortage of great stuff lined up, so read on for some picks, get out there and have a fantastic holiday! 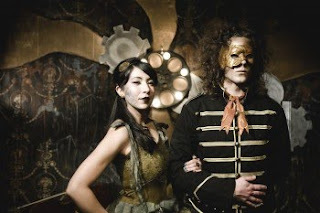 - The Loneliest Monk at Lincoln Hall with Aleks Eva and Hollows - This Chicago couple, Michelle Morales and Miles Benjamin, put on a live show that breaks away from the norm by mixing their art rock/chamber pop with a "masquerade ball" aesthetic. The show will celebrate the release of their debut album. 9 p.m., $10, 18 and over. Tickets. - Derek Nelson and the Musicians at the Empty Bottle with Pool of Frogs and Psychic Friends - Late last year Chicago-based folk-rocker Derek Nelson released his debut EP, Something Obscure (review here), a very impressive introduction to the singer-songwriter. He's since been singled out by many as one of the city's best up-and-coming acts and landed some notable shows, including a slot at the Taste of Chicago. 10 p.m., $7, 21 and over. Tickets. - Mazes at Hideout with Hotel Brotherhood - Check out our recent post to catch up on all that's been going on with this great Chicago indie psych-pop band. 10 p.m., $8, 21 and over. Tickets. - Silversun Pickups at Aragon Ballroom with Against Me! and The Henry Clay People - The lauded L.A. alt-rockers released their latest album, Swoon, last year, and with support from notable punk acts Against Me! and The Henry Clay People, should bring a killer show. 6:30 p.m., $27.25, 17 and over. Tickets. - The Heavy at Lincoln Hall with The Dirty Diamonds - These Brits have a wonderful style, blending indie rock with vintage soul sounds for a guaranteed good time. Be sure to arrive early for the Windy City's own Dirty Diamonds, who have a similar 1960s-meets-modern day aesthetic and are tons of fun. Click here for more on them. 10 p.m., $14, 21 and over. Tickets. - Tiny Vipers at the Empty Bottle with The Sight Below and The Spend - Celebrate the 4th with Sub Pop Record's Tiny Vipers (a.k.a Seattle-based songstress Jesy Fortino), who specializes in a dreamy, introspective sound as heard on her two full-lengths to date, 2007's Hands Across the Void and 2009's Life on Earth. 9:30 p.m. $8, $15 at door, 21 and over. Tickets. - The Thermals at Millennium Park/Jay Pritzker Pavilion with Disappears - The next up in Millennium Park's summer series of free concerts, a set from this high energy indie/alt rock trio from Portland should serve as a wonderful way to end the long weekend. Chicago's own Disappears will start things off. 6:30 p.m. free, all ages.